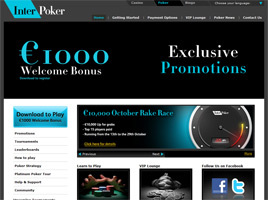 Players who are new to InterPoker players are entitled to a welcome bonus that’s worth up to €1,000. The actual amount given is simply a doubling of the first funds transfer and no Bonus Code is required. The money is awarded in €5 increments for every 150 Frequent Player Points (FPPs) earned. There is a 60-day window from the date of activation for the bonus to be claimed, and the minimum qualifying transfer is €10. First established on the Internet in 1996, InterCasino has long been a leader among gaming sites on the Internet, responsible for some $11 billion in secure transactions in more than 240 countries worldwide. In 2002, the company set up InterPoker as its dedicated poker room, which expanded rapidly to rank among the fastest growing card-playing venues online. InterPoker is part of the International Poker Network, using English as its main language but also available in German. Its downloadable software is powered by Boss Media technology licensed out of Malta. One distinctive feature here is how players are able to select their own operating currency at the time of sign up: U.S. Dollars ($), Pounds Sterling (£), or Euros (€). InterPoker has become the poker room of choice among discerning online players, and with good reason. Its games are sophisticated and secure. Its community is well established, including a presence on FaceBook and Twitter. And its players are top calibre. In fact, the web site is represented offline by professional Juha Helppi of Finland and the loyal members of the InterPoker Platinum Club—players who have earned the right to travel on the Platinum Poker Tour and take on pros in some of the world’s most popular holiday destinations. Each and every month, tournaments are scheduled with more than $3.4 million in winnings guaranteed. The games played include Texas Hold’em, 7-Card Stud, Omaha, and Omaha High-Low at fixed, pot, or no limit tables. There are satellites, sit-and-go tournaments, multi-table events with re-buys allowed, and ring games that run 24/7. Eight guaranteed tournaments are conducted each week with a prize pool of €110,000. Players who make it to the final three tables split an additional €50,000. On Sundays, a €75,000 tournament takes place with unlimited registration. And monthly leaderboard rewards top finishers with €1,000, plus a €15,000 WSOP travel package for each podium spot. Quick links to InterCasino and InterBingo give the poker players at InterPoker an easy way to take a break from the intensity of the tables. There are daily reports from WSOP events in the web site’s Poker News section, and tips on improving one’s game, from the basics of how to play to winning strategies, are offered here, too. All newcomers at InterPoker also receive a complimentary entry in the weekly €1,000 New Player Freeroll. It is held each Saturday at 17:00 GMT, and the entry is valid for up to two weeks after sign up. Anyone wishing to re-buy after elimination may do so for €0.50 during the 30-minute interval between qualifying rounds. Another regular freeroll is available to all players at 18:00 GMT on the last Tuesday of every month. It is called the “Loyalty Freeroll,” and eligibility is determined by prior play. Qualification requires at least 1,000 hands be played within the 30 days prior. All such tournaments can be accessed by clicking on “Freeroll” under the “Multi-Table” section of the poker client. Of course, player loyalty is also rewarded through the accumulation of FPPs, too. For Cash games, the number of FPPs awarded depending on the rake, amounting to 1 FPP for every €0.25 contributed during individual table sessions. For tournaments, 1 FPP is given for every €0.25 paid in entry fees. The FPPs can later be exchanged for bonus cash or additional entries in tournaments.